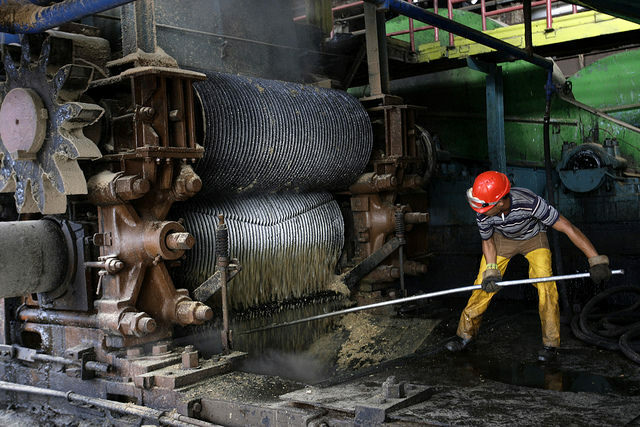 HAVANA, Sep 26 2014 (IPS) - Cuba’s sugar industry hopes to become the main source of clean energy in the country as part of a programme to develop renewable sources aimed at reducing dependence on imported fossil fuels and protecting the environment. The project forms part of the plans for upgrading and modernising sugar mills that have been opened up to foreign investment by Azcuba, the government business group that replaced the Sugar Ministry in 2011. Traditionally, sugar mills have generated electricity for their own consumption, using bagasse, the fibrous matter that remains after sugarcane stalks are crushed to extract their juice. For now, the production of ethanol as a by-product of sugarcane is not being considered in Cuba, although some experts argue that the biofuel could reduce consumption of gasoline by farm machinery and transportation and thus limit atmospheric emissions. “That is one of the issues being discussed and analysed by the government commission created to study the development of renewable energies,” said Manuel Díaz, director of the Cuban Institute of Research on Sugar Cane Derivatives. The official did not, however, rule out the possibility in the future. “Even if it is not the definitive long-term solution to the consumption of automotive fuel, ethanol is an important factor and contributes to reducing fossil fuel use, and if it does not run counter to the use of land for food, it could be, it seems to me, an alternative that each country should analyse depending on its specific characteristics,” Díaz said. The sugar industry currently accounts for 3.5 percent of electricity generation in this Caribbean island nation. 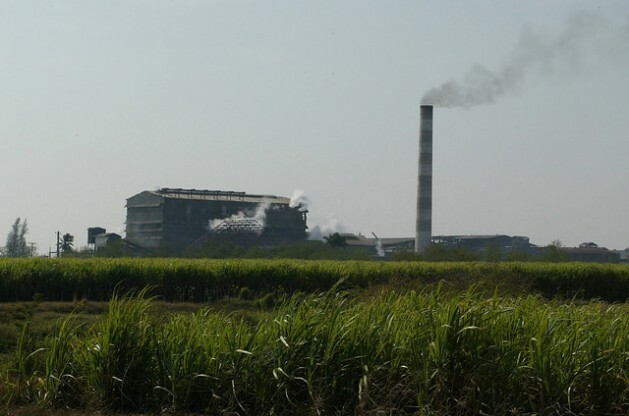 A target of the plan to boost energy efficiency is for around 20 sugar mills to generate a surplus of 755 MW by 2030, to go into the national power grid. That would raise the proportion of electricity produced by sugarcane biomass to 14 percent by 2030. The overall aim is for 24 percent of energy to come from renewable sources, including wind power (six percent), solar (three percent), and hydropower (one percent). Currently, renewable energy sources only represent 4.6 percent of electricity generation; the rest comes from fossil fuels. The gradual installation in the sugar mills of modern bioelectric plants needed to achieve that goal requires an estimated investment of 1.29 billion dollars, which Azcuba hopes to obtain from government loans or foreign investment. “If we don’t find a loan we will get foreign investment,” said Jorge Lodos, business director for Zerus SA, a subsidiary of Azcuba. The executive told Tierramérica that the first two companies to enter into partnership with Cuba in the sector included the bioelectric plants in their plans, to boost energy efficiency. The first of the plants that run on sugarcane biomass will begin to produce energy in 2016, Lodos said. It is to be built near the Ciro Redondo sugar mill in the province of Ciego de Ávila, 423 km from Havana, by Biopower, a joint venture established in 2012 by Cuba’s state-run Zerus and the British firm Havana Energy Ltd.
During the December to May harvest season, the plant will use sugarcane bagasse from the nearby sugar mill. The rest of the year it will use stored sugarcane waste and marabú (Dichrostachys cinérea), a woody shrub that has invaded vast areas of farmland in Cuba. The projected investment ranges between 45 and 55 million dollars. Meanwhile, the Compañía de Obras e Infraestructura (COI), a subsidiary of Brazilian construction giant Odebrecht, reached an agreement with the Empresa Azucarera Cienfuegos, another Azcuba subsidiary, to jointly administer the 5 de Septiembre sugar mill in the province of Cienfuegos, 256 km from the capital, for 13 years. In this case, the commitment is to bring the productive capacity of the sugar mill back up to 90,000 tons of sugar per harvest, or even higher. Lodos said investment in the project would surpass 100 million dollars, and would also include the construction of a bioenergy plant. These two sugar mills and the Jesús Rabí mill in the province of Matanzas, 98 km from Havana, will generate the first 140 MW of electricity in the medium term. Havana Energy and COI opened the door to foreign capital in Cuba’s sugar industry, just as investment has already been welcomed in other sectors of this country’s centralised economy. “Foreign investment requires mutual trust,” Lodos said. The socialist government of Raúl Castro estimates that the country needs between two and 2.5 billion dollars a year in foreign capital in order to grow and develop. Of Cuba’s 56 sugar mills, six of which are now inactive, Azcuba has opened up 20 to foreign investment. The initial priorities are the eight built after the 1959 revolution. Although ethanol production is not among the plans to be offered to foreign investors, many experts believe prospects for selling the fuel are good. Cuba produces alcohol in 11 distilleries, which are also to be upgraded, for pharmaceutical use and the industry that produces rum and other alcohol. Cuba’s once-powerful sugar industry, which produced harvests of up to eight million tons, hit bottom in the 2009-2010 season when output plunged to 1.1 million tones – the lowest level in 105 years. The industry currently represents around five percent of the country’s inflow of foreign exchange. The hope is that the modernisation of factories, machinery, transport equipment and other resources will boost yields and bolster production, along with the increase in the planting of sugarcane. Last year 400,000 hectares were planted and production in the 2013-2014 harvest amounted to over 1.6 million tons.